On the 12th my baby girl turned 3 and I turned into the kind of mom who calls here 3 year old a baby. I am not ashamed. 01. The birthday girl in a for reals big-girl-bed. 02. Playing brown bear + panda bear with Grandpa Ken. 03. Ahem. Slowly but surely: curly hair. 04. We'll pretend Z chose where to eat lunch. 06. I finished the Pope hat birthday crown. 07. These cupcakes were fan-freakin-tastic you guys! 08. She blew out the candles three times. 09. Forget the pope hat, Claire sent rad princess gear! 10. These magnetic dress-up dolls were a huge hit. 12. Mama + birthday girl. Here's Z's grid last year. You know, for reference. Did you document your 12th? Play along and link to your grid here. How fun that this month's collage day fell on her birthday! She's so cute, though I had no idea she was turning 3...I think of her as being so much younger than that for some reason. happpy birthday to your cute little one! looks like such a fun day! The curls! The curls! The hair was well worth the wait. So darling! Happy Birthday to your cute girl! Two. That is a fun age. I mean 3! Holy cow! She is 3??? Time flies. Those cupcakes look heavenly!! What a darling day for such a beautiful princess!! yea for the curls:-) Happy Birthday to your little cutie!!! One of these days I am going to remember to do 12 on 12!!!! Happy Birthday Z!! Three year olds are so much fun. Love the pics. And those cupcakes are definitely on my 'must try' list. OH MY HECK! I HAD NO IDEA SHE HAD SO MANY CURLY Q'S. I MISS YOU. I MIGHT HAVE TO GET CLAIRE THE PRINCESS GET UP FOR VALENTINE'S DAY AND THEN WE CAN COME OVER AND PLAY SOME TIME. thanks for the comment, it is fun to see who visits on the 12th. i love how red/pink your grid is. it is a very happy sight. your daughter's hair is lovely, i wish mine had those curls. How can she be three? She is such a darling little curly-haired princess. What a cutie! Happy Birthday. I didn't do the 12 on 12th because I worked a night shift the night before and then the night of -- so really, I didn't take any pictures... next month. Loved comparing to last year. :) Happy Bday to your little curly-headed cutie. I don't know what your talking about. I don't think Z's birthday crown resembles Pope's hat one bit. Okay, maybe a little. :) Happy third birthday little curly haired girl. Happy Birthday Z!!! I can't believe how fast 3 years has gone! Our girls are only days apart and they still have never met! What is up with that? I think it is to be expected that she still be called your baby, especially since she is your only! I'm glad she finally has those adorable curls. HOLY CRAP, the HAIR!!! I love it. Happy Birthday Zaley! I still find myself calling my oldest son my baby....aint no shame cause he was infact a child I birthed. Z, someday we will make it out for your birthday because your parties always look fabulous. Your curls are awesome. And I love me some DQ too. 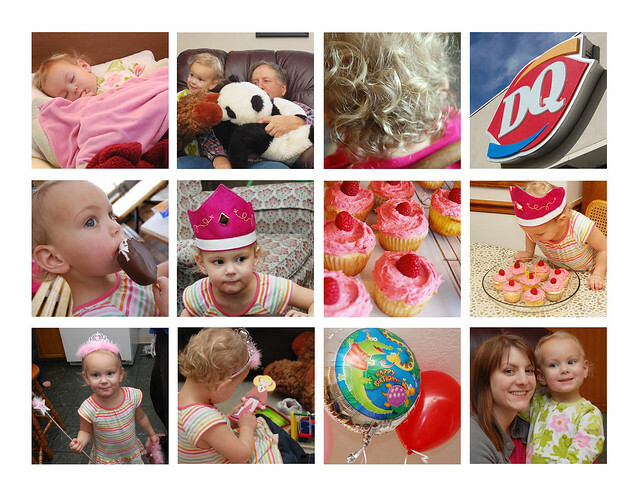 Your collage is chock full of pink, cuteness, love and cupcakes--how FUN!! Oh and the DQ. Love that place. Looks like y'all enjoyed a wonderful day of celebrating! Happy #3 to your little curly Q! Azalea is just too adorable, and it looks like she had an incredibly wonderful birthday. I love the pink cupcakes, the crown, and the curls (and the alliteration, obviously). She's getting so big, I can hardly believe it! Oh I love this birthday 12of12 celebration! ps I still call my almost 7 year old my baby. I think they just always are.